In spite of a decision taken by the Ukrainian authorities to provide billions in financing of the defense needs of the state in 2017, the fulfillment of the government defense order for this year has already been disrupted by the Defense Ministry, which hasn't signed contracts with the defense industry for the manufacture of new military equipment, a coordinator of the Information Resistance group, MP Dmytro Tymchuk of the People's Front party, said. "The state defense order for the purchase of new armored vehicles for the army was deadlocked a month ago, and is deadlocked now (yesterday I specifically asked directors of the enterprises about it). 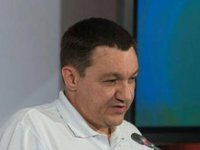 The reason is the same - the Defense Ministry does not conclude contracts with defense enterprises, having been disrupting the fulfillment of government defense order for this year," Tymchuk said in the comments posted on the Information Resistance (sprotyv.info) website in connection with the president's signing the amendments to the state budget for 2017 the other day. The lawmaker said that because of the position of military officials, despite the war, the defense industry capacities are idling, and thousands of workers of the defense industry will have to go on unpaid leave one of these days. "The new equipment will not be produced, although the financing of the state defense order (state guarantees) has been envisaged," he said. In this regard, Tymchuk recalls that when revising the budget for 2017 "practically all the branches of the government worked well: the parliament adopted appropriate amendments, the president quickly approved them." "If there is a reason for such a position of officials of the Defense Ministry - I really want to hear it, because it's unclear why we take out billions from the social welfare funds and give them to defense, but our defense industry is idling," the lawmaker summed up.